Book News: Big Names And A Few Surprises Among National Book Award Finalists : The Two-Way The prominent literary prize narrowed its nominees to 20 writers — a mix of heavyweights and many new ones. 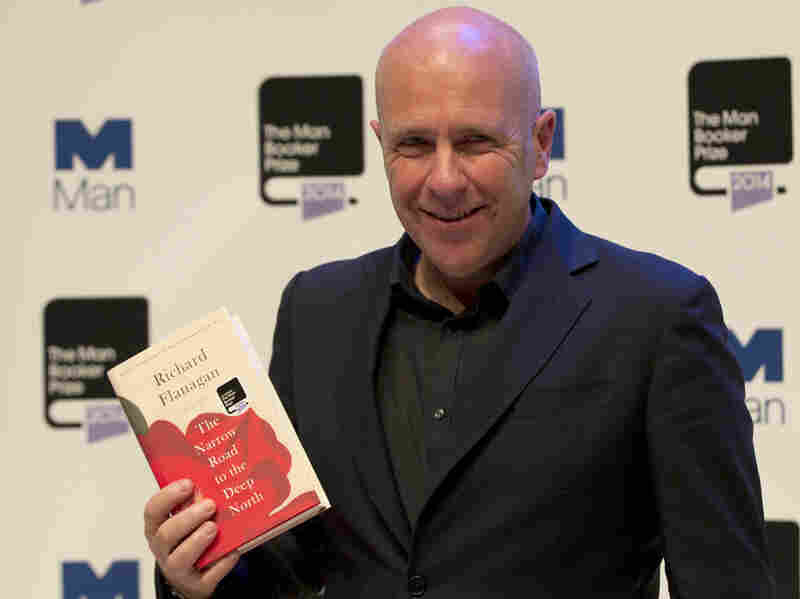 And across the Atlantic, Richard Flanagan won Britain's biggest award, the Man Booker Prize. With the stroke of a press release, the National Book Award nominees have been whittled to half their original number. Mitchell Kaplan, a recipient of the National Book Foundation's Lifetime Achievement Award, took to NPR's Morning Edition to announce the five finalists for each category: fiction, nonfiction, poetry and young people's literature. In fiction, the list of finalists included some surprises — not so much in terms of the authors left standing as those who were left off. Perennial favorites Richard Powers, a former National Book Award winner (in 2006), and Jane Smiley, a former Pulitzer winner, both failed to make the leap from longlist to short — while younger writers such as Phil Klay and Emily St. John Mandel did. But as NPR's Lynn Neary notes, the fiction shortlist is not entirely bereft of big names. "It seemed like a sure bet that literary heavyweights Jane Smiley and Marilynne Robinson would be among the five fiction finalists," Neary says. "But Smiley didn't make the shortlist for Some Luck, while Robinson did for Lila, the last book in her series that also includes Gilead and Home. She won the Pulitzer for Gilead, and Home was a finalist for the 2008 National Book Award. If I were a betting woman, I would give her pretty good odds for winning the award this year." But Neary adds, "Since everyone likes an underdog, I'll keep that money in my pocket — just in case one of her lesser-known competitors steals the prize." Rabih Alameddine and Anthony Doerr round out the fiction nominees, for An Unnecessary Woman and All the Light We Cannot See, respectively. If the fiction shortlist saw some big names fall away, the poetry nominees still include plenty. New collections from Louise Glück, Fanny Howe and Claudia Rankine have all been named finalists, among others. And on the nonfiction side of the fence, nominees range from John Lahr's tome of a Tennessee Williams biography to New Yorker cartoonist Roz Chast's graphic memoir, Can't We Talk About Something More Pleasant? Lastly, the shortlist for Young People's Literature has finalists as disparate as The Port Chicago 50, Steve Sheinkin's history of an oft-forgotten civil rights tragedy, and Noggin, John Corey Whaley's humorous tale of the trials of coming of age — which are made all the more difficult with a misplaced head. Check out NPR Books for a look at the full lists, and for detailed descriptions of all 20 finalists. The winners will be announced Nov. 19. Australian author Richard Flanagan holds his book The Narrow Road to the Deep North, at the Royal Festival Hall in London on Monday. On The Road With Booker: Richard Flanagan has taken home the Man Booker Prize for his World War II novel, The Narrow Road to the Deep North. Announced Tuesday night at a ritzy ceremony broadcast on the BBC, Flanagan's win spells an award of about $80,000 and inclusion on a list of popular past winners, such as Hilary Mantel and Eleanor Catton. Flanagan's win also means that fears of an American conquest of the Booker have so far proved unfounded. Despite expanding to include American authors for the first time, and even featuring two on this year's shortlist, Britain's most prestigious literary prize has instead gone to an Australian writer for just the third time in the award's 46-year history. A.C. Grayling, the chair of the Booker judges, commended Flanagan's account of a prisoner of war working on Japan's "Death Railway" between Burma and Thailand. "Written in prose of extraordinary elegance and force, it bridges East and West, past and present, with a story of guilt and heroism." In Flanagan's acceptance speech, the writer declared that he doesn't share the pessimism voiced by others about the contemporary novel. "Novels are not content. Nor are they a mirror to life or an explanation of life or a guide to life," Flanagan said. "Novels are life, or they are nothing." From Clicks To Bricks: Amazon's going brick-and-mortar — at least for a little bit — with plans to open two pop-up shops in California for the holidays, according to GeekWire. News of the shops, which will be located in San Francisco and Sacramento, comes on the tail of rumors that the online retailer also has designs on opening a similar store in Manhattan. West In Ferguson: Scholar and activist Cornel West was among more than 40 protesters arrested during demonstrations Monday outside the police department in Ferguson, Mo., as NPR reported.